The Spring Intermediate Thursday season will play at Foundation Tavern starting May 9th. Games will begin at 6:30pm each week and play into the evening. During the regular season, teams will play all 3 games regardless of the outcome of the first two. 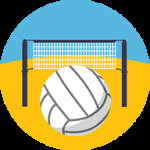 Check out this Volleyball (Sand) league '19SPR - VOLLEYBALL SAND INTER. COED (RATIO 2:2) - FOUNDATION TAVERN (THURSDAYS)' with Lehigh Valley Leagues!